Jamal Safi - Who is Jamal Safi? Ph.D. , Chemistry and Toxicology of Pesticides, Faculty of Agriculture, Alexandria University, 1989. M.Sc., Chemistry and Toxicology of Pesticides, Faculty of Agriculture, Alexandria University, 1984. B.Sc., Chemistry of Pesticides (Plant Protection), Faculty of Agriculture, Alexandria University, 1981. Professor of Pesticide Chemistry and Toxicology, Al-Azhar University -Gaza, PNA. Since January 12, 2003. Assistant Professor of Pesticide Chemistry and Toxicology, Al-Azhar University - Gaza, PNA. Oct. 1996 to June 1997. Dean, Faculty of Agriculture, Al-Azhar University-Gaza, PNA. Jan 1995 to Oct. 1996. Assistant Professor of Pesticide Chemistry and Toxicology, Al-Azhar University-Gaza, PNA. Oct. 1993 to Dec. 1994. Dean, Faculty of Agriculture, Al-Azhar University-Gaza, PNA. Sept. 1992 to Oct. 1993. Assistant Professor of Pesticide Chemistry and Toxicology, Hebron University, West Bank. Sept. 1990 to Sept. 1992. Chairman of The Executive Committee, and Founder of the Environmental Protection & Research Institute (EPRI), Gaza, PNA. 1991-present. Consultant at Scientific Center for Equipments, Chemicals and Pesticides at Alexandria, Egypt. Oct. 1986 to Sept. 1989. Researcher at Arab Scientific Institute of Research and Transfer of Technology. West Bank. Jan. 1985 to Aug. 1986. Principal Investigator and Team Leader, Assessment of New Strategies for Screening of Blood for HCV. USA USAID-MERC Funded Project in cooperation with Boston University, MA. Nov. 2002-Dec. 2004. Principal Investigator, Screening of Desert Plants of the Middle East for Antimalarials. Germany Trilateral DFG Funded Project in cooperation with Technical University of Munch, Munchen Oct. 2002-Sep. 2004. Principal Investigator, Transboundary Air Quality Effects from Urbanization. USA USAID-MERC Funded Project in cooperation with San Jose State University, CA. April 2001-March 2004. Principal Investigator and Team Leader, Cost-Effective Strategies For Pooled Screening of Blood. 2002. USA USAID-MERC Funded Project in cooperation with Boston University, MA. Oct. 1999-Sept. Principal Investigator, Bioremediation of Marine Pollutants By Marine Cyanobacterial Mats - An Interdisciplinary Approach. Germany Trilateral DFG Funded Project in cooperation with Oldenburg University, Max Planck Institute for Marine Microbiology and Technical University of Munch. July 1998-June 2003. Principal Investigator, Pesticide Residue Analysis in Gaza Strip. Germany Trilateral DFG Funded Project in cooperation with Technical University of Munch, Munchen. Jan.1998-Dec. 2000. Principal Investigator, Childhood Lead Poisoning Prevention in Middle East. USA USAID-MERC Funded Project in cooperation with Center of Disease Control Atlanta-Georgia. Oct. 1997-March 1999. Principal Investigator, Integrated Organic Waste Recycling System. Germany Trilateral DFG Funded Project in cooperation with Hohenheim University and Bonn University. June 1996-May 2001. Principal Investigator, Environmental Solution to Problems Caused by Arthropods of Public Health Importance in Jordan Rift Valley and the Gaza Strip. USA USAID-MERC Funded Project in cooperation with Harvard School of Public Health, Harvard University, MA. Oct. 1994-Nov. 2000. Principal Investigator and Team Leader, Prevalence of Hepatitis C Among Blood Donors in Gaza Strip. USA USAID-MERC Funded Project in cooperation with Institute of Medicine, National Academy of Science, Washington DC. Dec. 1994 - March 1996. Principal Investigator “Developing of Established Ecologically acceptable pesticides for the Use Warm and Sunny Regions. EC Funded Project. Jan. 1994 - Dec. 1995. Developed and Delivered a Training Course for Agricultural Engineers on Promoting Occupational Safety in Environmental Protection in Agricultural Sector (Pesticides and Occupational Health) in Gaza Strip. Held in Gaza City. MAP Canada Funded Project. August 6 to 21, 1995. Developed and Delivered a Training Course for Agricultural Engineers on Environmental Awareness “Pest Control and Minimizing the Use of Pesticides”. Held in Gaza City. MAP Canada Funded Project. August 23 - Sept. 15, 1994. Developed and Delivered a Training Course for School Teachers on Environmental Awareness “Environmental Protection and The Introduction of Environmental Education Principles in the General Education “ Held in Gaza and Khanyounis. July 24, to August 24, 1993. National Temporary Advisor, Regional Center for Environmental Health Activities (CEHA), World Health Organization (WHO), Environmental Health Training Courses for UNRWA. 23 July - 3 August 1995. Team Leader, Environmental Awareness Project: Pesticide Extension Program for Agricultural Engineers and Farmers. EC Funded Project. Oct. 1994-Sep. 1998. Principal Investigator, Pesticide Survey and Residue Analysis in Fruits and Vegetables in Gaza Strip. USA - American Embassy Funded Project. Sept. 1993 - August 1994. Principal Investigator, Health Impact Study in Beach Camp - Gaza Strip in 1993 and 1998. UNRWA Funded Project. Team Leader, Establishment of Environmental Chemistry and Toxicology Laboratory at EPRI. Japanese Funded Project, July 1992-Dec. 1993. Boston University for Cost-Effective Strategies For Pooled Screening of Blood. August 5-10, 2002, MA, USA. San Jose State University for Transboundary Air Quality Effects from Urbanization. August 11-16, 2002, CA, USA. Oldenburg University for Bioremediation of Marine Pollutants By Marine Cyanobacterial Mats- An Interdisciplinary Approach. November 6-12, 1999, Oldenburg, Germany. Bonn and Hohenheim Universities for the Integrated Organic Waste Recycling System. Germany, July 12-22, 1997. NIEHS for Collaborative Program of Technical Communications, Health Sciences Research and Training and Health Effects Prevention for Agricultural Chemicals in the Middle East, North Carolina and Washington D.C., April 1996. Harvard School of Public Health for Environmental Solutions to Problems Caused by Arthropods of Public Health Importance in Jordan Rift Valley and Gaza Strip. Boston, Massachusetts and Washington D.C. Sept. 10-15 1996. Founder of the Environmental Protection & Research Institute in Gaza Strip 1989. Delegate of the Palestinian Delegation, Middle East Peace Negotiation, Multilateral Working Group on Environment (1992-1996). Founder of Faculty of Agriculture and Environment, Al-Azhar University-Gaza, PNA, 1992. Councilor, Community of the Mediterranean Universities (2000-present). International Visitor Program Sponsored by the United States Information Agency and Administrated by Education Development Center. Environmental Education in United States. Sept. 21-Oct. 18, 1995 USA. International Visitor Program Sponsored by The United States Information Agency - Bureau of Education and Cultural Affairs, Arranged by Academy for State and local Government. April 1-10, 1993. USA. The British Council (FCO Fellowship) as a Visiting Scientist to work in the neurotoxicity of pesticides at Medical Research Council-Toxicology Unit, Carshalton Beeches, Surrey, U.K, from 17th June to 16th September 1991. Member of the Palestinian Environmental Protection Authority, PNA. Member, Board of Trustees, Applied Research Institute, Jerusalem (ARIJ), 1990-present. Member, Board of Trustees, Palestine Consultancy Group, Jerusalem, 1994-present. Member of the Pesticides Scientific Committee, Gaza, PNA, 1998-present. Member of the Environmental Health Committee for the Middle East Region, 1993-present. 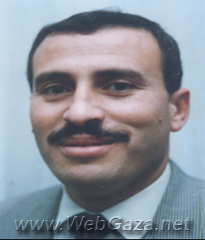 Member of Arab Consultants Group (ACG), Gaza, PNA, 1990-present. Member of Agronomist Association, Gaza, PNA 1990-present. SAFI J. M., Abu Mourad T. A., Yassin M.M., (2003). Hematological Biomarkers in Farm Workers Exposed to Organophosphorus Insecticides in Gaza Strip. Submitted for publication in March 2003 at Human & Experimental Toxicology. El-Nahhal Y., SAFI, J. (2003). Adsorption of Benzene and Phenanthrene to Modified Montmorillonite. Submitted for publication in May 5, 2003. The Science of The Total Environment. (JGF/279). Safi N M D, N. Lee, J. Koster, J. SAFI, Y. El-Nahhal, M. Wagner and J.Rullkotter (2003). Biodegradation of Petroleum Moedel Compounds by Cyanobacterial Mats in Mesocosm Experiments in Gaza (Palestine). Accepted for oral presentation in 21st International Meeting on Organic Geochemistry, September 8-12th, Krakow-Poland. El-Nahhal Y., SAFI, J. (2003). Adsorption of Phenanthrene on Organoclays from Distilled and Saline Water. Accepted for publication in May 31, 2003. J.Colloid & Interface Science. El-Nahhal Y., SAFI J. M. (2003). Stability of an Organo Clay Complex: Effects of High Concentration of Sodium Chloride. Accepted for publication in Jan. 9, 2003. Applied Clay Science. SAFI, J. M. (2002). Multiresidue Analysis of Pesticides on Grapes Distributed in Gaza Governorates, Palestine. Alex. Sci. Exch., Vol. 23 No 2, pp. 169-183. Safi N M D, J. Koster, J. SAFI, Y. El-Nahhal and J.Rullkotter (2002). Biodegradation of polycyclic aromatic petroleum compounds by cyanobacterial mats in mesocosm experiments in Gaza (Palestine). 3rd European Meeting on Environmental Chemistry, December 11-14, Geneva/Switzerland. M.M.Yassin, T. A. Abu Mourad, J. M.SAFI (2002). Knowledge, Attitude, Practice and Toxicity Symptoms Associated with Pesticides Use Among Farm Workers in Gaza Strip. Occupational and Environmental Medicine.Vol. 59 (6), pp 387-393. SAFI, J. M. (2002). Association Between Chronic Exposure To Pesticides and Recorded Cases of Human Malignancy In Gaza Strip (1990-1999). The Science of The Total Environment. Vol. 284/1-3, pp 75-84. SAFI, J. M., N. S. Abu Foul, Y.Z. El-Nahhal and A. H. El-Sebae (2002). Monitoring of Pesticide Residues on Cucumber, Tomatoes and Strawberries in Gaza Governorates, Palestine. Nahrung/Food. Vol.46:(1) pp 34-39. El-Nahhal Y.; SAFI, J. (2002). Contamination of Plant Food by Organic Chemichals: Food Safety Status: Problems and Recommendations. Proceeding of FAO-UN/ Regional Workshop On Post-Harvest in the West Asia and North Africa Region. Cairo 3-6, Feb. Pp: 501-507. SAFI, J. M., N. S. Abou-Foul, Y.Z. El-Nahhal, A.H.El-Sebae (2001). Monitoring of pesticide residues on green pepper, potatoes, vicia faba, green bean and green peas in Gaza Governorates, Palestine. J. Pest cont. & Environ. Sci. 9 (1): 55-72. KASCHL Arno, EL-NAHHAL Yasser, SAFI Jamal, CHEN Yona and ROEMHELD Volker (2001). Trace Metal Leaching After Municipal Soild Waste Compost Application to A Sandy Soil in The Gaza Strip. Proceedings of 6th International Conference on The Biogeochemistry of Trace Elements, July 29th – August 2nd 2001, Guelph, Canada, P 164. Saue, W; Viergever, A.; Virins, W; Safi, J. (2001). Gaza City Hazardous Waster Management; Infoplan.Gaza, pp 1-134. SAFI, J. M., Y.Z.El-Nahhal, M.G. Kaware, N. S. Abu –Foul, K. M. Tubael and A. H. El-Sebae (2000). Initiation of Pesticide Environmental Extension and Public Awareness Program For Palestinian Community in Gaza Strip. J. of Pest Cont. & Environ. Sci. 8 (2): 75-98. SAFI, J. M., Hassan Soliman and Y. Z. El-Nahhal (2000). Surveillance of School Children Prevalence of Infectious Parasites in Beach Camp at Gaza Palestine J. of Pest Cont. & Environ. Sci. 8 (2): 123-134. Nadia, Saber A., Amal A., Rady A.and SAFI J. M. (1999). Influnce of pesticide pyrethroid deltamethrin pollution on the phospholipid composition of carp erthrocyte plasma membrane. Egyptian Journal of Occupational Medicine. 23 (2):243-254. Kaschl, A., V. Romheld, H. Schnabl, Y. Chen, Y. Hadar and J. Safi. (1999). The Gaza Strip and the refuse problem. German research- magazine of the Deutsche Forschungsgemeinschaft, p. 16-21. Kaschl, A., V. Romheld, H. Schnabl, Y. Chen, Y. Hadarv and J. Safi (1999). Der Gaxastreifen und das Mullproblem. Forschung- Das Magazin der Deutschen Forschungsgemeinschaft 2/1999, p. 4-9. El-Sebae A., and J.M. SAFI (1998) Pesticide Residues and Environmental Pollutants as Cytotoxic Endocrine Disrupters In Humans and Wildlife. Egyptian Journal of Occupational Medicine. Vol. 22 No.2, 177-195. SAFI, J. M. (1998) The State of the Environment in Gaza Strip. Presented in The International Colloquium On Environment and Developing, Monitoring Systems: Information and Decision Making Instruments. Dec. 7-10, 1994. Rabat, Morocco. Alexandria Science Exchange Vol. 19 No.1, 137-150. A. Kaschl, Y. El Nahhal, T. Abu Mourad, K. Tubail, J. Safi, Y. Hadar, Y. Chen and V. Romheld (1998.) Long-Term Field Experiment to Examine the Agricutural Application of Municipal Solid Waste Compost in The Gaza Strip. VDLUFA-Schriftenreihe 49. Richter E., S. Gasteyer, S. El Haj, M. Jaqhabir and J.M. SAFI (1998): Agricultural Sustainability, Pesticide Exposures, and Health Risks: Israel, the Palestinian National Authority, and Jordan. Annals of The New York Academy of Sciences. Vol. 837, pp 269-290. El-Sebae A. H., K.S. El-Gendy, J.M. SAFI and A. Kenawy (1997). Aluminum Cation Feed Toxicity to Male Mice. Egyptian Journal of Occupational Medicine. Vol. 21 No.2, 215-228. Richter E. and J.M. SAFI (1997): Pesticide Use, Exposure, and Risk: A Joint Israeli-Palestinian Perspective. Environmental Research, 73,211-218. Schecter A., Olaf Papke, Jad Isaac, Nader Hrimat, Fater Neiroukh, J.M. SAFI, Y.El-Nahhal (1997): 2,3,7,8,Chlorine Substituted Dioxin and Dibenzofuran Congeners in 2,4-D, 2,4,5-T and Pentachlorophenol. Levels in the Environment Organohalogen Componds. Vol. 32, 51-55. Schecter A., O.Papke, J.Ryan, P.Frust, Jad Isaac N.Hrimat, F.Neiroukh, J.M. SAFI, El-Nahhal, S. Abu El-Haj, A. Avni, E.Richter, P.Chuwers and A. Fischbern (1997): Dioxins, Dibenzofurans, and PCBC in Human Blood, Human Milk, and Food from Israel, the West Bank, and Gaza. Human Exposure. Organohalogen Compounds. Vol. 33, 457-461. SAFI, J. M. (1996): Liver Enzymes as Biomarkers of Exposure to Organphosphorus Pesticiseds. Alex. Sci. Exch., 17 (4): 351-360. SAFI, J. M., El-Alem, A, Abed Y, Suleiman H, El-Najar K, and El-Nahhal Y. (1996): Prevalence of HBV and HCV Among Blood Donors in Gaza Strip. Presented in the Xth International Congress of Virology, 11-16 Aug. Jerusalem. Amr, N.A. Hemeida, A.El Tarras, M.M. Abou Ahmed, M.A. Omar, U.A. Ali and J.M. SAFI, (1996): Gentic Toxicity of the Pesticides Hostathion, Sumithion and Dithane M-45 in rates - The 5th Annual Conference THEME together for Health Promotion of Agricultural Community 16-17 Jan. Cairo. SAFI, J. M. (1995): Special Problems Associated with Pesticides Use and Its Management in Gaza Strip. Egyptian Journal of Occupational Medicine, 19 (2): 267-276. Johnson, M.K. & J.M. SAFI (1993): The R-(+) Isomer of O-n-Hexyl S-Methyl Phosphorothioamidate causes Delayed Neuropathy in Hens After Generation of A Form of Inhibited Neuropathy Target Esterase which can be Reactivated Ex -Vivo. Chem.-Biol. Interactions, 87 (1993) 443-448. Elesvier Scientific Publishers Ireland. SAFI J. M., Y. Z. El-Nahhal, S.A. Soliman and A.H. El-Sebae (1993): Mutagenic and Carcinogenic Pesticides Used in the Gaza Strip Agricultural Environment. The Science of the Total Environment, Vol. 132: 371-380. SAFI, J. M. ; Y. Z. El-Nahhal ; M. Kaware ; A. El-Alem ; F. H. El-Fara ; N. Abou Foul ; M. Hammalawi ; M. Abed El-Rahman ; S. AFIFI ; F. Radwan ; A. K. Jouda (1994) : Environmental Awareness : Pest Control and Minimizing the Heavy Use of Pesticide " . Gaza pp 1-452. SAFI, J.M. ; F. H. El-Fara; Y.Z. El-Nahhal: A. A. Khatib; Y. Abed; A. El-Alem; and N. Abu Foul (1993): Environmental Awareness: Environmental Protection and the Introduction of Environmental Education Principles in the General Education. Gaza, pp 1-221. SAFI, J.M. (1989): Structure Activity Relationship. Chemical Structure- Delayed Neurtoxic of nBu-DDVP, Piperophos and Pyrazophos. Ph.D. Thesis, Faculty of Agriculture, Alexandria University, Egypt. Ibrahim, A.M., J.M. SAFI, A. H. Ahmed and A.M. El-Shazly. (1988): Glycinates as a Chemical Group in the Field of Pesticides. I-Synthesis and Identification of New Ethyl N-arylglycinate Derivatives. J. Pest Control & Environmental. Sci. 1: 59 – 68. Ibrahim, A.M., J.M. SAFI; A.H. Ahmed and A.M. El-Shazly. (1988): Structure Activity Relationship. III-Phytocidal Activity of Ethyl N-arylglycinate Derivatives on Rice and Barnyard. Presented in the First Conference of Weed Science. May 25-26, Alexandria. Ibrahim, A.M., J.M. SAFI; A.H. Ahmed and A.M. El-Shazly. (1988): Structure Activity Relationship. II-Phytocidal Activity of Ethyl N-arylglycinate Derivatives on Wheat and Common Vetch Seedlings. Presented in the First Conference of Weed Science. May 25-26, Alexandria, Egypt. Ibrahim, A.M., J.M. SAFI; A.H. Ahmed and A.M. El-Shazly. (1988): Structure Activity Relationship. I-Phytocidal Activity of Ethyl N-arylglycinate Derivatives on Cotton, Common Purslane and Jungle-rich Seedlings. Presented in the First Conference of Weed Science. May 25-26, Alexandria, Egypt. El-Shazly, A.M.; A.M. Ibrahim; A.H. Ahmed and J.M. SAFI, (1985): Fungicidal and Bactericidal Properties of Ethyl-N-arylglycinate Derivatives. Alexanderia Science Exchange, 6 (3): 259-269. SAFI, J.M. (1984): Structure Activity Relationship: Synthesis of Ethyl N-arylglycinate Derivatives and Their Biological Activities Pesticides. M.Sc. Thesis, Faculty of Agriculture, Alexandria University, Egypt.